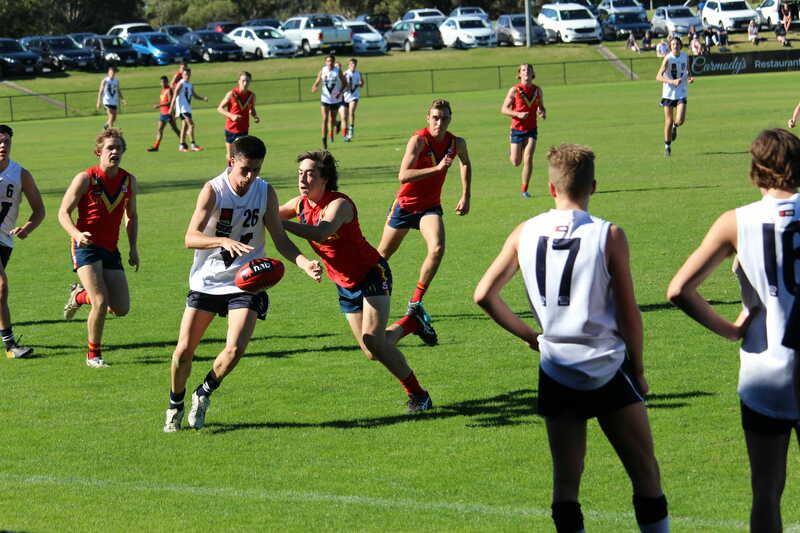 IN a day that was not pleasant viewing for Victorian fans, we headed down to Southport to check out the Under 18s matches in which South Australia and Western Australia showed off the talent for the 2020 draft. There’s not much of 2003-born Dudley, but the excitement machine packs a punch. Standing at 163cm, it is not hard to imagine how he plies his trade – zipping around would-be tacklers, snapping highlight reel goals and enjoying the celebration. Dudley was in and out of the game, but there was always a sense of anticipation when he went near it. The most exciting thing about his game today was how clinical he was from set shots – with two of his three goals coming from long range kicks over the mark. The third, of course, was a clever snap in the fourth quarter that we may come to expect from the youngster. Dean made an immediate impact with the first goal of the game and stayed right in it with consistent accumulation through the midfield. He just seemed to constantly pop up and find the ball around the stoppages, finishing as SA’s equal-highest baller winner with 21 disposals. His clearance work is clearly a strong point, and his six for the day were mixed in well with subtle handballs out of congestion and into space. Hopefully with time the Glenelg product can develop his outside game and continue to rack up high numbers. The other Croweater to amass 21 disposals, Roberts was a damaging figure in the midfield. He fed well off the extraction from the likes of Dean and Luke Edwards, pushing SA forward with his 16 kicks and five inside 50s. Roberts’ five marks were also a testament to his work rate on the spread, but he would be looking to bulk up and improve his inside work to become a more complete midfielder. While Liddy did not have huge numbers, he was thereabouts all day and proved a figure of consistency. The Sturt product was composed in traffic and showed good agility to slip his opponents when looking to move the ball forward from tight spaces. His 12 disposals were mostly either important or effective, with three of them being clearances, two inside 50s and one a rebound. Liddy’s three tackles and marks rounded off a solid contribution. The son of Adelaide great Tyson and brother of Jackson, Edwards showed his good footballing pedigree with a solid first half display. The potential Adelaide 2020 father-son pick dug in for eight tackles and burst out of congestion well with four clearances. While he was solid in the contested stakes, he could perhaps have been cleaner below his knees, and drifted out of the game somewhat later in the game, despite winning 18 disposals. Baldwin was another who had a greater impact than what his stat-line would suggest. His contested marking overhead was outstanding; both deeper forward in the first half, and higher up the ground as the game wore on. Baldwin found his way into the game in the second term when he booted his lone goal and missed the chance to add another within a minute. He continued on with an assist to Zac Dumesny in the third term before clunking a couple more contested marks to finish the day with seven overall with 15 disposals. Thilthorpe had a great outing, sharing the ruck duties with James Borlase. At 197cm he used his size to advantage, but was even better in his movement around the ground, collecting 16 disposals and clunking three marks. His 15 hitouts, four clearances and three inside 50s highlight his true impact around the stoppages as almost a fourth midfielder. Thilthorpe looks to be a real modern day mobile ruckman with plenty of room to grow and develop. Bruhn was far and away Country’s best player on the day, putting in a complete display amongst a disappointing team performance. With 24 touches, he was the highest possession getter on the ground, adding seven clearances, seven rebound 50s, four inside 50s, four marks and four tackles. With two thirds of Bruhn’s disposals being kicks, it was a shame that his damaging presence did not go further as Country faltered forward of centre. Still, his drive and efficiency from the back half and midfield did not go unnoticed and his key traits surely caught the eye. Lazzaro was a constant in the stoppages, doing most of his work in-close through the midfield throughout the game. He tackled hard with five overall and managed five clearances, with two of them being rebound 50s. Should he fill out in the coming year or two, he could be a heavy presence at the Under 18 level. Another to pitch in at the stoppages, Maher was the beneficiary of South Australia’s solidity in the sense that he was one to keep heaving the ball back from where once it came. With 13 of his 18 disposals being kicks, four of them being clearances, four being inside 50s and another three as rebounds, Maher possessed the ball in key areas and did not shy away from the contest. Bar the clearances, Gadsby’s stats read very similarly to Maher, except he tended to contribute more so on the outside with some dash and composure going forward. His 18 disposals (12 kicks, six handballs), six inside 50s and goal came on the back of a willingness to take the game on and test the South Australian defence. It was easier said than done, but you cannot say Gadsby did not try. His goal on the run in the second quarter was a highlight, as he showed real zip to break away. Ugle-Hagan was one who didn’t do a whole lot throughout the course of the game, but caught the eye when he was in possession. A few twists, turns, strong contested marks and clean pick ups were enough to suggest we may see a few more highlights from him in the future. Western first caught the eye in the opening term when he burst through the middle on a lightning run to hit up Logan McDonald for one of his three first-quarter goals. His speed from the wing was damaging, and while it only came in spurts, it left spectators wanting more. His few inside 50 entries also highlighted his potential to do serious damage when on song. Schofield was one of the more effective midfielders out there with his endless run and abilty to get on the end of handball chains. Starting with an effort off half-back, his defensive pressure soon became known as he was again pestering his opponents deep forward, where he almost ended up with a clever dribbled goal. His forward drive was immense, and there where times where Schofield would be directing his teammates around him with ball in hand as if to coordinate the attack like a quarterback. A clever operator, Schofield already proved to be a crowd favourite. There’s a lot to like about the Swans product as a solidly built midfielder. Starting at the opening centre bounce, Trew’s first big play was a releasing handball forward which opened up play, followed by a composed kick across the 50 that highlighted his rare vision. Later in the game, his overhead marking came into play as he floated between the 50 arcs, contesting hard in the air. Trew’s aggression also came to the fore as he was not afraid to get stuck in and lay some hard tackles. McDonald quite simply took the game by the scruff of its neck and tore it apart in the opening stages, booting WA’s first four majors. It was a complete display from the forward; with goals from leads, holding the ball free kicks, and open play snaps helping him to come away with a bag of six after two more final quarter goals. He could have had more, too, with two misses in the opening term doing little to take away from his reputation as a beautiful kick for goal. At a slight 191cm, McDonald has plenty of time to grow into his key forward position and can work on earning the ball higher up the ground. Allen was one to slowly but surely work his way into the game with some impressive overhead marking in the third term. The Swan Districts talent was at real presence at 194cm and 84kg, using his size well to lead up to the wing and clunk a few big grabs. His efforts were rewarded in the final term with a goal in between McDonald’s final two. The Black Swans key man put in a tough shift in his defensive 50 post, marking or intercepting almost everything that came his way. His hands overhead were exceptional, and he showed a willingness to take the game on with quick exits out of defensive 50. A defender’s defender, the best way to describe his game was solid – as a rock. Mallard is an absolute prototypical unit at 197cm and 88kg. Spending most of his time in the ruck, he looks a natural footballer with a casual style who enjoys being out there. His mobility and overall work around the ground was brilliant, with some nice overhead marks taken all over the gaff and a booming kick on him to boot. His ruckwork was also solid, and he showed good control with his taps to put the ball into space for his midfielders. Jenkins was a regular in the Metro midfield and worked hard to effect as many contests as he could. A smother in the first quarter set the tone for the rest of his game, and he would have had a sensational goal on the run from 50 had it not been touched on the line. With some good run and agility, Jenkins showed he can put in the effort to get the best out of his talent. The Diamond Creek product led from the front and did everything in his power to make his side’s performance more respectable. His burst from the clearances early was a highlight, and he showed good agility to keep some nippy would-be tacklers at bay. The younger brother of Gold Coast’s Darcy, Macpherson has the same willingness to push the ball forward at all costs and break through whoever may be in his way. An overarching theme of his game was leadership, and he can hold his head up high for that. While he was not the most consistent player out there, Ford put together a collection of plays good enough to catch the eye. Most of his good work was done early, with no less than four displays of strong overhead contested marks, as well as an explosive burst through three players in the opening term. He continued to do his best to turn his opposition in the second quarter, but can work on his disposal and staying in the contest for longer. Tucker was utilised in a variety of roles throughout the day. Starting forward, he provided a good presence and took a nice contested mark in the early stages. He managed to snare Metro’s only goal for the first three quarters with one sneaking out the back in the second term. Later, he could be seen rucking and swinging down back in a decent overall display.